Michael VIII reigned as Byzantine Emperor 1259–1282. 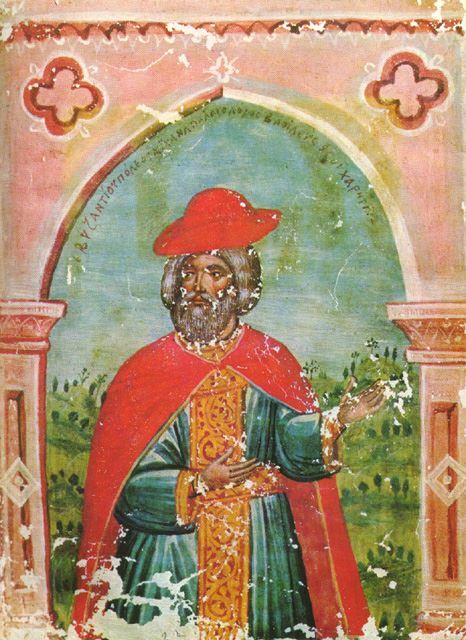 He was the founder of the Palaiologan dynasty that would rule the Byzantine Empire until the Fall of Constantinople in 1453. Michael came to power following a coup against the influential bureaucrat George Mouzalon, seizing from him the guardianship of the eight-year-old Emperor John IV. Michael was given the titles of megas doux and despotēs, and in 1259 he was proclaimed co-emperor. Shortly afterwards, he had the 11-year-old John IV blinded and imprisoned. In reconstituting the Byzantine Empire Michael VIII restored the old administration without endeavouring to correct its failures. In recovering Constantinople and investing in the defence of his European provinces, Michael VIII began to denude the Anatolian frontier of its troops and was forced to lower their pay or cancel their tax exemptions. This policy led to the gradual collapse of the frontier, which was infiltrated by Turkish bands even before the death of Michael VIII in Pachomios village, Thrace in December 1282.